Construction work on the new Worcestershire Parkway is progressing well. The main station building is nearing completion and the internal fit-out works have begun. Worcestershire County Council's Cabinet Member with Responsibility for Economy and Infrastructure, Councillor Ken Pollock said: "Every time I visit the site I am amazed at the progress being made. 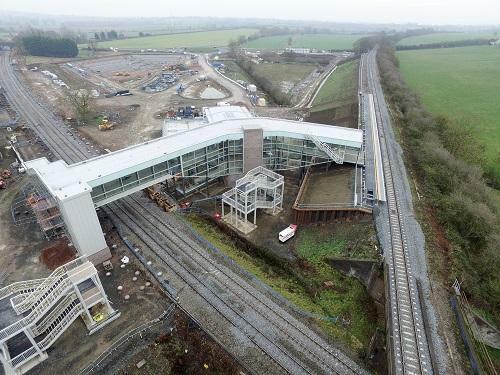 "With the main station building now being fitted-out and the opening date expected late this year, the goal of trains stopping at Worcestershire Parkway Station is now in sight". Station construction is set to be completed during the summer. Once complete, before it can open, it has to go through the standard rigorous Entry into Service process. This includes the inspection and testing of facilities, station staff training, driver training, completion of certification and the formal station hand-over to Great Western Railway, who will operate and manage the station, and Network Rail who will manage the rail infrastructure. Worcestershire County Council currently expect the station to be open during the final quarter of 2019 with passengers being able to access services on the North Cotswold and Cardiff-Gloucester-Birmingham Lines which intersect at the station. Marc Riley of Buckingham Group Contracting Limited, Worcestershire County Council's contractor for the scheme, says, "We are confident of completing the station works by the summer to enable the Entry into Service process to begin and for the station to be open once this process is complete later this year". Great Western Railway services operating between Hereford/Great Malvern/ Worcester, and the Thames Valley and London Paddington via stations including Pershore, Evesham, Oxford and Reading will call at the station along with services between Cardiff and Nottingham. When the station first opens, journey times and the frequency of services to and from London Paddington will be similar to current services - roughly hourly across the day with some additional services in the peak periods. However, the Council is working with the North Cotswold Line Task Force to secure the investment necessary to improve on this in the future – the ambition being a 2 trains per hour service between Worcester and London, made up of a full hourly train service between Great Malvern, Worcester and Paddington, and an hourly service between Kidderminster, Worcester and Paddington. Trains operated by Cross Country between Cardiff and Nottingham via stations including Gloucester Central, Cheltenham Spa, Ashchurch for Tewkesbury, Birmingham New Street and Derby and which do not currently stop at Worcester stations will call at the new station from opening. The County Council and its partners are also keen for Cross Country Plymouth-Newcastle and Bristol-Manchester services to call at Worcestershire Parkway in the future. This will go even further towards transforming Worcestershire’s direct rail connectivity to major UK economies in the south-west, north-west and north-east. To further these ambitions the Council has developed a comprehensive Rail Investment Strategy and is working closely with its partners in the rail industry, other local authorities and Worcestershire's MPs.